We found this recipe in Plenty and thought it sounded strange enough to be worth trying. I’m not generally a big fan of fruit in savory dishes, and I’d certainly never had mango combined with eggplant, but the recipe talked up the combination so highly I was convinced. 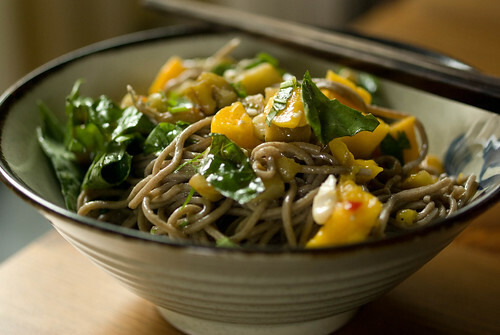 It’s a sort of weird fusion: Japanese buckwheat soba noodles with fried eggplant cubes, fresh mango, tofu, lots of basil, and a Thai-style dressing of lime juice, sugar, vinegar and chiles. Result? It was certainly edible, but I thought it a bit weird. A liberal application of nam pla prik helped quite a lot, but I still found myself discarding the mango from my portion. I might make a version of this again, but minus the mango and plus a lot of fish sauce in the dressing.